John W. Stacey is the Chief of Police in Bellevue, Nebraska. The Bellevue Police Department is widely recognized as a premier example of a connected agency. Chief Stacey leadership is this regard has been key to the department’s success. Stacey will present his vision on the management of the use of social media in policing in his presentation “Managing the Connected Agency” on Wednesday, March 24th at ILEA’s “Leadership in a Cyberworld” Conference. Why would a Midwestern police agency feel the need to get involved in electronic social media? What possible value could come to an agency that spends time and resources on a program that seem vastly separated from the normal nuts and bolts of a Law Enforcement Agency from a region of agriculture and wide open spaces. The City of Bellevue Nebraska is directly in the cross hairs of America, bordering on the State of Iowa. When you picture Nebraska, do you think of Cowboys on horseback, cornfields, cattle ranches, etc.? In some parts of our country it is believed we are still at war with the native Americans. In actuality, this is a bustling metro-area of over 1 million. Home of Gerald Ford, Mutual of Omaha, Union Pacific Railroad, Henry Doorly Zoo, STRATCOM, Malcolm X, Johnny Carson, and Larry the Cable Guy, just to name a few. Being a true hub of diversity, electronic media is essential. Newspapers, radio, TV are slowly being replaced by the Internet and like forms of electronic media. In the not too distant past, most of the population got their news either from the newspapers, Radio, or TV. Now, the norm is to get your information electronically off the internet. This route, the social media freight train, has left us three choices: 1. Let it continue without us. 2. Watch it go by as it runs over us, or 3. Get on it and enjoy the ride. Responsible Law Enforcement Agencies understand that we are a business of providing information. To be effective, we must be able to correspond to all portions of the community regularly. This route, the social media freight train, has left us three choices: 1. Let it continue without us. 2. Watch it go by as it runs over us, or 3. Get on it and enjoy the ride. Obviously if you plan to communicate with your entire community you should already be in your seat. At the Bellevue Police Department, we’ve been enjoying the ride with our foray into the world of social media. Adopting social media does not come easy, nor does it come without some type of cost. Generational issues truly highlight the separation in the workforce. Just like the community, closing that gap is insurmountable for most who hail to the traditionalists or baby boomer generation. It is doable, but requires considerable patience and leeway from managers, along with extra time resources that will invite and not discourage involvement in social media. On top of that, is the long standing practice of coveting information that is given to a police officer and not to share it with anyone. From the Academy to retirement, this is the rule. The lesson of obtaining as much information as possible from all sorts of sources, protect it, bring it back, and never ever share it as it does not belong to you. The ultimate challenge begins here. Developing techniques that allows for a loosening of the information accountability while training all generations on the benefits of structured social media. Patience, flexibility and an open mind is a requirement for everyone, including management. Once a basic understanding is achieved, open discussion between the active communicators and those who are new to the concept begin. 2. It gives clarification and concise direction on how to interpret the policy. This assists staff with the capability of further refining the policy based on the type of feedback from the questions posed. With such a new concept, discussions are important to ensure a holistic understanding of principles. For example, an officer must protect personal information by keeping his or her personal site separated from public access. Data such as phone numbers, family information, detailed personal history do not need to be accessible to those with criminal intent. On that same token, it must be fully understood that what is posted the officer is responsible for and it will be a permanent record, somewhere. Have a basic understanding of copyright laws, know the boundaries of ownership and follow them. Most important, make clear this is an extremely fast growing and evolving area and policy and procedures will have to be fluid as they change to keep up. Good common sense is the foundation for most decisions that arise that are not found in policy. Access to a supervisor or commander when the decision gets too grey must be attainable at any time. Finally, don’t force anyone, give them the boundaries and freedom and let them go. Lets face it, we give them a gun and the right to take someone’s freedom away at a moments notice, give them the capability to work through this. Marga van Rijssel is the Online Community manager and strategist at Politie 2.0.; the Dutch Police’s online community built on the Ning platform. At SMILE Conference she will speak about Ning, what it is and what you can do with it. She will address the Ning technique, how it works and how to build a Ning community. Managing the community you’ve built and how police benefit by community engagement on the Internet. In history there have always been moments of transition. There will be a break with former times; a transformation. And with a transformation always comes a paradigm shift. A change from one way of thinking to another. It just does not happen, but is driven by agents of change. After that the world is adapting to the changes and is organizing it self along new lines. The industrial revolution is a transformation which was caused by the rapid development of new techniques and their application. This revolution happened in different phases. The upcoming of iron founding and steam power at the end of the 18th and the beginning of the 19th century led to a switch from manual to mechanical manufacturing of goods. The major change happened in the textile sector. Particularly the textile industry has been the leading sector of the industrial revolution. The invention of the steam train in 1824 made the transport of goods easier and speeded up the industrialization. The coming of steal, electricity, turbines, internal combustion engine and oil characterize the second industrial revolution. Communication and digitalization characterize the third industrial revolution. New ways of communication that are upcoming from the end of the 19th century and the introduction of the computer in the middle of the 20th century make it possible to seek information almost everywhere in the world. Globalization is making its entrance. Every transition causes changes. The industrialization brought urbanization and an exodus of the rural area. Home industry made place for mass fabrication. People went working in fabrics. There was the upcoming of an new social class, the working-class. In the beginning of the industrialization there was a lot of resistance. There were straight riots of unemployed home workers, who were pressed out of the market by cheaper working new factories. At this moment there is a transition going on to the information age. Acquire and canalize of information is more important now than the production of goods. The canalization and processing of information cultivates in the old industrial countries continues larger capital currents in comparison to the old industry. Besides the canalization of information there is the entrance of the word “network” or “community”. That is not a new concept, but never before networks did manifest themselves more powerful as nowadays. Network thinking is part of the new paradigm and seems to give an answer to the closed hierarchic organizations. Some people talk about a recession, but when you look from a longterm perspective a transition is taking place, the “digital revolution”. This transition changes society in a fundamental way. No one who sits in the middle of it, knows exactly how it tuns out. There are many questions with open ends on which no one knows the answer. According to Moore’s law the speed of computers doubles every 18 month. It is not the increase in speed it self that is interesting, but above all what you can do with this increase of speed. The internet is available for a broad public since the beginning of the nineties of the 20th century. An high speed broadband connection to the internet is since 2005 for almost everyone a possibility. Mobile internet is emerging fast. All kinds of applications that we thought impossible 15 years ago, now are impossible to think away. Think of email, online shopping en banking, reading the newspaper on the internet, the possibility to download films en music, blogs, Youtube, Google Earth, LinkedIn, Flickr, Hyves, Skype, Wikipedia, web-tv channels and push media. And this is just a small grab out of all the possibilities the internet has to offer. An invaluable amount of information lays within easy reach. The fundamental change that is taking place in society, is not caused by political upheavels or economic developments, but by the digital revolution. Home shopping is becoming more and more easier. Working at home is now already a possibility and will be normal in the future for lots of people. Communication via the internet changes the way of working together, the culture and manners. Hierarchic structures will disappear and giving way to networks where everything and everyone is connected. All people gradually get an IP number and are thus connected to the Internet. Man and machine are more and more integrated. Right now an important part of people always carries a cell phone to be accessible, to be able to chat and to have information available within direct reach, preferably location based. As the network becomes so intertwined, a trend can be observed that everyone has entrance to all information any time. Work and private increasingly run into each other. You can then say you don’t want to do home shopping or work at home. Past experiences learn that there is really no choice. What is technically and economical is justified, sooner or later will happen. People will stay shorter in one job. Jobs are constantly changing nature and content. The job of those who are educated today, does not exist at this moment. In the work someone does, technology will be used that has to be invented yet. The Internet of ten years ago was characterized by static webpages. It was only possible to look at information. The Internet looks like a very big encyclopedia at distance. The amount of mobile phones is little, but is increasing. This Internet is also referred to as Web 1.0. In recent years there are coming more and more opportunities on the Internet to actively create, add and share information. People exchange information with each other within communities. The internet is used to co-operate. The term “prosurism” is introduced. The user is now a consumer as well as a producer of information. For consuming and producing information there are on the Internet many applications and tools available. This Internet is also referred to as Web 2.0, the social web. As more information becomes available on the Internet, the Internet becomes more intelligent. Web 3.0 is called the intelligent or semantic web. The Internet breaks out of the computer en spreads it self over many other devices in an open environment. The Internet is thus not only available at fixed locations via PC or laptop, it also connects devices to the Internet. For example, a car can be connected to the planning of the garage and car parts are ordered based on sensors in the engine. In this way the Internet will be integrated in the physical world. It is everywhere and always available(‘ubiquitous’). Networks will be connected to each other. With tools like Twitter real-time information will be exchanged. All changes that come with the introduction of new internet technologies, will lead to a new way off working in the broadest meaning of the word. It is about other ways of working together than now are usual, like sitting in the office together, having meetings and a altogether briefing and debriefing. The technologies that are now available make new ways off working together possible. The Internet drives the paradigm shift. Web 2.0 has an impact for the police and the information organization of the police. The Internet offers new challenges, uncertainties, insecurities, and threats for public safety. Boundaries don’t exist anymore. The police cannot close the eyes for all these changes and can only confront all the challenges in an adequate way by going to work in a different way: “new crimes, new methods”. To establish this our organization should be constantly changing. From a closed culture to an open culture where it is common to work together and share information, from hierarchic communication to networking. Sharing information inside as well as outside the organization, national and international. The police is an information intense organization. Police work is about data, information, knowledge and intelligence. Only a part of the information can be found within the information systems the police uses. A mass of information can be found on the internet. To use information to support the police work in the right way on strategic, tactic and operational level, space for innovation will be necessary. Police workers will have to get and be involved within the discussion about todays information systems, the future information strategy and internet strategy and the corresponding information services of the Dutch Police. Police employees will have to get space en possibilities to think along about innovative applications that support police work in the right way. People that come with good ideas must have the feeling that their efforts will be recognized and rewarded. Managers will build a level of trust that is necessary to initiate and support this change of culture. On the Internet we have created an open digital community Politie 2.0. Politie 2.0, the possibilities of the digital revolution for the Dutch Police. This community has the goal through “crowd sourcing” to give as much people as possible the opportunity to think along and discuss about the present information services and the future information strategy and internet strategy of the Dutch Police. It is about the Police on the Internet, new challenges in a new age, Open Source, national and international collaboration, privacy, security, the utilization of web 2.0 tools, the meaning of web 2.0 for the police, innovation, change of culture, cybercrime, intelligence, the very complex information services, communication, cloud computing, twitter, participation of citizens in police work and about many other subject. The theme of Politie 2.0 is “We know more than I”. Everyone is allowed to think along and every contribution, how small it is, is welcome. All the information can be used by police corps in their own environment for example to organize information sessions. In this way is has to be realized that there will be a solid and supported information and internet strategy for the Dutch Police. The goal is that there will be a discussion going on about the existing information services and how these can be improved. That a current stream of small innovations is under way. Small innovations that support police officers to do their work in the periphery of society and the security of citizens can improve. On the digital community Politie 2.0 there is lot of information to be found about Web 2.0 and what it means for the Police. The information can be found in blogs, discussions, videos, links, photos, audio, recommended books, documents and presentations. There is even an online course about Web 2.0 tools linked to the site. There is not only online activity within the community, there are also offline meetings where information is shared. Upcoming events are published at the site. It’s my job to make sense of things in the world of social media so that law officers who want to use these tools can concentrate on being officers rather than having to be social media experts themselves. It’s no easy task even for me, a person who makes it her priority and considers it a big part of her job in higher ed. While I read everything I can find on the topic, I haven’t been able to find a succinct method, already created, that I would recommend for police. Even Forrester Research’s method is problematic, at least for law enforcement. Forrester calls its method P.O.S.T. for “people, objectives, strategy, and technology”. The main reasons for which I won’t recommend it is because of what it leaves out. And that’s policy and schedule. Policy is an absolutely crucial element to law enforcement because it addresses a big part of the “how” and “why”. It’s crucial for business too, but I won’t go there. The other missing element is schedule, the “when”. Deciding what you want to do is a big part of the job, but knowing exactly when each element will happen, will go a long way towards keeping the plan manageable. So I’ve developed my own social media method and I think it’s a good one. It’s easy to follow, isn’t missing key items and reflects exactly what I do when I’m working with clients. The C.O.P.P.S. Social Media Method™ answers the who, what, when, where, why and how. 1. Citizens. Regardless of any cool tool or social media method, don’t lose sight of the fact that it’s all about your constituents, the citizens. Who do you want to communicate with? As you answer that question, remember to include those who you already are communicating with, and keep them on your radar. In your plan, include every demographic that’s important to your communication plan, whether you feel like you’re already communicating with them or not at all. Your citizens are already talking about you. As you develop this part of your social media plan, listen to the key public figures in your community. Keep your ears open for mentions of your agency whether online or off. Go into online newsgroups and blog and run some Google alert searches to “hear” the mentions of your department. Consider developing personas to represent the members of your target audience. Personas aren’t real people, they are demographic descriptions of the people in your audience. Sit down with your team and discuss the character traits of each persona. This will help you to understand their personalities, online habits, attitudes and opinions of your law enforcement agency specifically as well as law enforcement generally. In my workshops with government employees in both the U.S. and Canada, the task of developing personas has proven to be the single biggest generator of conversation and deliberation. There’s more to it than you think. So do it! The process of developing personas affects every other step in this process. Take it seriously because it’s very helpful. 2. Objectives. As you develop this section, resist the urge to do anything other than to address the “what” in your goals. DO NOT worry about anything other than WHAT do you want do achieve. b. Raise awareness of your services? e.	Inspire people to take action? a. What attitudes define us and our issues? b. What sites have the most activity related to my organization? c.	What kind of people do the most posting (and where)? d.	What other organizations are issues are these people connected to? e.	What kind of negative comments or misconceptions exists? f.	What are the positives? When you’re done examining your objectives, you should have a clearly defined message. Going forward, adhere to this message in all your online (and offline) dealings. Keep your message easy to grasp by people with short attention spans and keep yourselves focused on the message. You should by now have a really good handle on your target audience and at least have begun to determine what changes, if any, are needed in your agency’s communication strategy. I’m half tempted to call this step #3 “parts”. This is the nuts and bolts. What are the social media tools you’re going to actually deploy? What technology, software and hardware do you need, whether you already have it or not, to deploy. Think back to the personas you created in step 2. Figure out what social media platforms your constituents are using, and include them in the PLAN. a. This is where you decide if you’ll be on Twitter (oh yeah) Facebook (most likely) a blog (quite possibly) YouTube (maybe) Bebo (Gang members in your world?) LinkedIn (your own professional life). There are several hundred more, depending on your target demographic(s) what part of the world you’re in, and your ultimate goals. b. What content do you already have that you can reproduce? Do you need to create any? What are your ideas and goals and how do they relate to the tools? What’s your message? c. One of the crucial parts to the plan is personnel. What people do you have? Don’t rely on the intern. The local college student might know how to register you on Twitter about 10 seconds faster than you could do it yourself, but s/he does NOT know your objectives like you do nor can an intern articulate your message at the same level of quality than you. Even if s/he could come close, s/he is leaving at the end of the semester. That doesn’t mean you shouldn’t let them in on it to learn the ropes. I’m all about that. Just stay in control. A really great role for an intern is to research the platforms your constituents are on, especially if they are their peers. Don’t underestimate the person-hours involved. Social media isn’t a “ten minutes a day” thing in spite of what you hear. d. Take into account the staff person’s knowledge level. If you want success, make sure they’re technically competent, comfortable and trained. They also need the hours allotted to them to work the program and the desire to do so. Don’t underestimate the value of professional training. There are many online resources but they are best used as supplements to a good fundamental grounding provided with professional training. 4. Policy. EVERY law enforcement agency in the world should have a social media policy or should address it in its current communication/media policy. The agencies who never intend to deploy social media tools are the ones most in need of a policy. For more on the topic, see the ConnectedCOPS article on social media policy for law enforcement. I’ve been thinking lately that agencies need all the above within their policy for their communication program and another policy altogether for investigative practices. But I’m still working/thinking on that. 5. Schedule. The absence of a schedule can be the biggest reason humans begin to feel overwhelmed and projects get derailed. Do yourself a favor and create a schedule depicting what “parts” (go back to #3) will be rolled out when. Factor in required training, technology procurement and etc. Start by rolling out the simpler pieces of the plan. Ask yourself where you want your agency to be in three / six / nine months and work back from that. If you’re a project manager by training, put it into Microsoft Project or something similar. If not, an Excel spreadsheet will suffice as long as someone is managing it. The biggest time consumers are anything to do with blogs, podcasts or video. Be hyper-sensitive to those pieces of the plan if, in fact, they’re part of it. 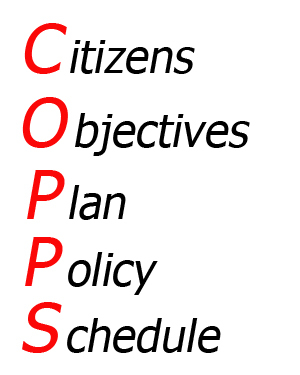 This five-part plan – C.O.P.P.S. – is a fool-proof method for devising a social media strategy for your agency. It answers all the pieces – who, what, when, where, why and how. If you follow it, it will work. If you something needs clarification, please let me know.